'United we can fight. We can't fight singularly. We have to band together with like-minded people to stop this destruction of our country and make sure that our country is safer for our younger generations.' — Harry Dare, chairperson, Barngala Determination Aboriginal Corporation. There were, to quote Port Augusta's Transcontinental, 'hundreds ' of us crossing the bridge on Sunday 19 August, the 'younger generations' in the forefront. The glory of the Flinders Ranges were well in sight to our east, the international grain farming land of Kimba 158km to the southwest. The constant cry 'Not Flinders, Not Kimba, No waste dump is our call' rang out. In recent weeks there have been many developments in the federal government's plan for a national radioactive waste management 'facility'. In time for the planned vote by a tiny percentage of those who will be impacted by the site selection, the Resources Minister, visiting both regions, tripled to $31 million the amount which the federal government is offering the final site community. And instead of 15 promised jobs, there are now 45. Paradoxes abound. The $31 million includes $3 million allocated for 'Aboriginal economic and cultural heritage' — awarded for a project which many Adnyamathanha say will destroy the Aboriginal culture of the region. The proposed facilities design finally appeared three years into the campaign. In online form originally, the 18 new government documents, rejoicing in a 'brand new industry' for the chosen site area, were posted to each householder in time for the beginning of the proposed ballot date, which was to have been 20 August. Over the past months the Senate Inquiry called by Centre Alliance South Australian Senator Rex Patrick received 40 pro/58 against submissions. Hearings took place in Kimba and the Flinders in July. On 2 August, various government bodies were required to appear at the Canberra hearing — with the Australian Conservation Foundation and Friends of the Earth environmental experts denied access. 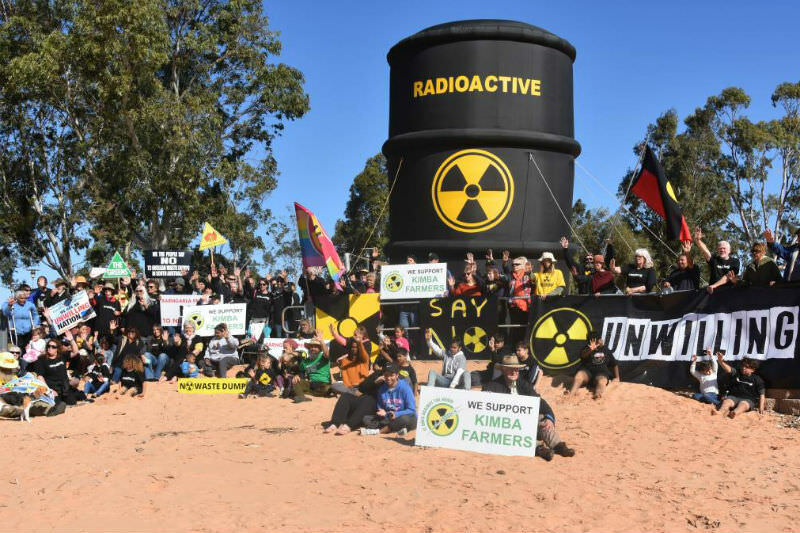 Some of the farmers, Traditional Owners and others who oppose the nuclear facility/storage have, for months, been asking government personnel for a formal debate locally, held between the proponent experts and those opposing. What did eventuate? The government's preferred method: a webinar with no uncomfortable audience presence. The government's preferred site: the 21st floor of a Sydney building, 1500km away from both regions. During that 10 August debate Bruce Wilson, principal government advisor, repeated his assurances that worldwide there has never been an accident in the transport of nuclear waste. It's puzzling why someone would make such a categorical statement. Friends of the Earth's Dr Jim Green pointed out that in the UK for example there are an average of 19 such incidents annually; in France there are 100. On 14 August the Barngarla lifted proceedings to another level. Arguing that native title-holders who live outside the municipal borders of Kimba should be included in the Kimba postal ballot, the Barngala applied for and obtained an injunction. In the meantime the Department, in consultation with both councils, agreed to suspend the proposed ballots for the nominated sites until that matter is resolved. In the 26 August ministry reshuffle, Senator Canavan retained his portfolio. As Resources Minister, he often repeats his assurance: 'Australia's nuclear waste facility will not be imposed on an unwilling community.' The marchers across the Port Augusta Bridge wore T-shirts and bore banners printed with a single word: UNWILLING. Michele Madigan is a Sister of St Joseph who has spent the past 38 years working with Aboriginal people in remote areas of SA, in Adelaide and in country SA. Her work has included advocacy and support for senior Aboriginal women of Coober Pedy in their campaign against the proposed national radioactive dump. Great insights into a poorly conducted process Michele. Thank you for your wise voice and active advocacy in this issue that impacts all regional South Australians, and honours the perspectives of Aboriginal leaders and community. The work continues.....thank you. Unwilling, not only are the Traditional owners, farmers, and locals of the specific areas unwilling but also people state wide. As a grape grower whose industry will be affected by the loss of our clean green state I applaud Michele Madigan in her advocacy and the people of these targeted areas who are standing up against the modern day beads and trinkets of a cash buyout. How courageous of these people to resist this short term gain which will be to the economic deficit to the whole state. Thank you Michele Madigan for keeping this story before us. Two quotes from your article remind me that what we call "democracy" is seriously flawed: "the Australian Conservation Foundation and Friends of the Earth environmental experts denied access." ". . . a webinar with no uncomfortable audience presence. The government's preferred site: the 21st floor of a Sydney building, 1500km away from both regions." Thanks to Michele for this excellent summary of the situation facing people living near the sites that the Federal government has designated. Since it’s clear that the local people are unwilling, the Minister should abandon his plans to transport nuclear waste across the country and house it instead close to Lucas Heights. Candice Champion’s words “… my family have studied, witnessed, watched and grown on that land for 60,000 years” reflect the Indigenous perspective of what is of value and significance to their communities. Our Australian Government looks at this situation, and so many other situations regarding our natural environment, from an economic perspective, with little, if any, concern about the impact of such a drastic imposition on the land, culture and communities. If the Government believes that this ‘facility’ will have little effect on the people or environments being proposed, why are they striving so hard to ‘buy’ these communities to place this ‘structure’ in a place that is so remote? Is there no government land elsewhere in Australia that could be utilized, that would also minimize movement of nuclear waste? Thank you so much, Michele, for your support and accurate summary of this ongoing battle. It has been a calculated strategic and tactical exercise to secure a site for the NRWMF in a reasonably remote area of the country, but relatively close to a small, economically vulnerable community. In this case, two such communities have been pitted against each other. The process has been more about finding a political solution to a problem that has been festering for over 40 years, than about about finding the most suitable site geologically and socially. Recently Senator Canavan wrote, "radioactive waste is currently located at more than 100 locations....and consolidating it into a single, safe and purpose built facility is in line with international best practice and Australian Government policy". A single (suitable) site for all Australian radioactive waste does not seem unreasonable, however, the Minister then goes on to explain that while low level waste will remain at this site, after "a few decades....a separate permanent facility" will be constructed to dispose of the intermediate level waste. The NRWMF will not be one single site, there will be two! The Department has wrought much social damage on two communities and has been relentless, unstoppable and impervious to reason and logic. My spirit groans each time you remind us, Michele, that this terrible prospect still looms over our beautiful Flinders and the quality grain-growing area of Kimba. It's a bad idea and the people who can see beyond the short-term financial gain to the ruin of magnificent healthy country are right to protest with that powerful word 'UNWILLING'. I'm unwilling too and I live in the suburbs! Thank you Michele for another well researched article on this very important topic. The selection of the Flinders Ranges, a prime environmental area and popular tourism site, and Kimba, a key food producing region, for a nuclear waste dump is folly. It is true that we need to store the radioactive waste that has already been generated, but the advice of environmental health and safety experts is that such wastes should not be transported the long distances envisaged nor should they be anywhere near residential areas or where people go and certainly not in food growing regions. And we should support Aboriginal people in relation to this matter. The indigenous people of Maralinga suffered greatly as a result of the irresponsible decision of Robert Menzies to allow the British government to test nuclear weapons there in the 1950s. The LNP federal government is showing that it cares little about environmental care apart from a few vague comments. It continues to push the mining and burning of coal, extending fracking (coal seam gas extraction) and felling of our natural forests. In her best selling book "This Changes Everything: Capitalism vs. the Climate", Naomi Klein argues that first nation people are critical in the struggle to ensure that effective action is taken by world leaders to address climate change and the widespread pollution that is already causing vast public health problems around the world. All of us who care about the environment and the health of future generations must work with Aboriginal communities, farmers involved with Farmers for Climate Action and Lock the Gates campaign along with other environmental organisations to protect our planet. This is a clear and overall view of the state of play, in this sorry and poorly informed campaign by the nuclear lobby and federal government to put it over rural communities and get them to accept a nuclear waste dump. As always, Aboriginal people are at the forefront of opposing this ill-advised plan. It is heartening to see Catholic Religious Australia bringing out the hard questions about transport dangers, and 'stranded' nuclear wastes. The ABC have failed us on this issue. The timing was bad for me, in the car returning from the rally at Port Augusta where the nuclear waste threat is very real to many people. The deception and bribery have divided families and communities. Then on the radio, a new show and a new name - "The People versus" and Josh Szeps with some very biased "experts" aggressively interrogating a couple of innocent "ordinary people" who both did a great job defending the popular and correct view that nuclear is a threat in various ways. And Josh kept saying it was about low level waste - in deceptive denial of the so-called intermediate waste to be stored there for decades above ground presenting a target for terrorists and missiles. And that so-called intermediate waste is called high level waste in France ... so many lies !!! In South Australia we have had enough of the lies. Thanks for your work Michele. We need the truth. PS my submission to the Senate Inquiry was never published - so add at least one to the number opposing. Thank you Michele for bringing important facts on this potentially devastating impact on our 'Country' and challenging us to think things to the end!